Find free reports and dashboards packages on AppExchange. Install a reports and dashboards package from AppExchange. Modify the reports and dashboards in the installed package. When you’re building a report or dashboard, a common strategy is to clone an existing report and modify it to meet your needs. But where do you get sample reports and dashboards to modify? Maria, the admin over at Ursa Major Solar, looks no further than AppExchange! On AppExchange, there are sample report and dashboard packages available from Salesforce Labs. These can be downloaded and installed into your sandbox or production environment. The packages are free and the reports and dashboards can all be cloned and modified to suit your specific needs. Whether you’re looking for Sales, Service, Activity, CRM, or adoption-related dashboards, there are sample reports and dashboards available for you. Keep in mind that some apps contain tabs, fields, objects, and more. And there are governors and limits in Salesforce, which your org is subject to. Apps can either be managed or unmanaged, and your overall limits are affected in different ways depending on which type you choose. When you’re installing any app, keep your limits in mind. You can learn more about this topic by viewing the AppExchange Installation Guide. To install an app, log in to AppExchange, find the app you want, and click Get it Now. During the installation process, you’ll need to make a few decisions. Where do I install—production or sandbox? Some of the packages come bundled with a handful of custom fields. Reports, dashboards, folders, and custom fields all have names, which can conflict with existing names in your org. Packages all come with report and/or dashboard folders. Once you know what specifically you’re installing, you can decide where you want to install it. You can preview all the components in the package during the installation process. Do you want to give permissions to admins only, all users, or specific profiles? Who can have access to these reports, dashboards, folders, and in some cases, custom fields? This is an area where you want to do a bit of preplanning before you install, so you don’t have to make updates to profiles and folder sharing settings after you install. Once your installation is successful, you receive an email confirmation. Now you’re ready to go! Here’s how to find what you just installed. From Setup, enter Installed Packages in the Quick Find box, then select Installed Packages. Click the name of your installed package. This will be the same name on the page where you downloaded the package from AppExchange. This opens the Package Details page, where you can see all the components, including reports, dashboards, folders, custom fields, and more. 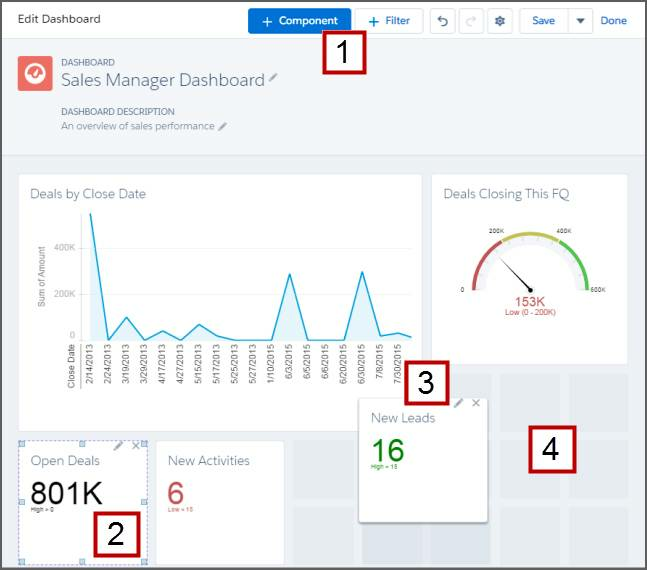 The easiest way to browse all the reports and dashboards is to view them from the Reports tab in Salesforce. Now you can see all the reports and dashboards you just installed. The very first thing you need to remember when modifying an existing report is to make a copy. The last thing you want to do is mess up someone else’s report! To make a copy of a report, open it and click Save As . Give your copied report a name, choose the Private Reports folder, and click Save. You can always move it to another report folder later, but this is a safe place to experiment with reports before you’re ready to have others use them. Now you can safely customize the report. If you open an AppExchange report or dashboard with features that aren’t supported in Lightning Experience, the unsupported features are suppressed but not removed. The feature won’t appear in Lightning Experience, but if you open the report or dashboard in Salesforce Classic, then it’ll be there. For more information, see Lightning Experience Limits. 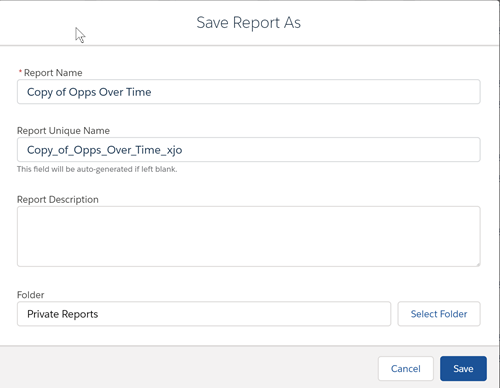 As you’re getting started with modifying an existing report, try doing simple things like adding and removing columns, changing the column order, and changing the date range field and criteria. You can also add new filters and change the report format as you get more comfortable. As you make changes, remember to save often and click Run Report to see your finished result, as the preview pane only displays a limited set of records. As with reports, make sure you clone a copy so that you don’t mess up someone else’s dashboard! 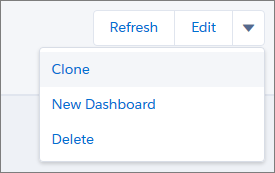 To clone the dashboard, open it up and click Clone. Enter a name, specify a folder, and click Create. Then click Edit to open the dashboard in edit mode in the drag-and-drop dashboard builder. Now you can see how the dashboard was initially created. Let’s take a closer look. Remember, you can add components and filters , change a component by clicking , drag and drop a component , and rearrange components . As you’re getting started with modifying dashboards, one of the best things to do is simply change dashboard component types. To this end, try taking a single report and building a dashboard with that same report displayed in each dashboard component type. This will give you a good sense of how each dashboard component type works. Now that you know how to install a report and dashboard package and you have assessed what’s in the package, time to start making modifications! Remember to always use Clone before you get started. Here are some common ways to customize an existing report or dashboard. Try them out!